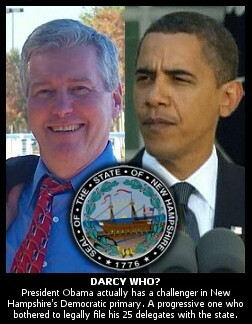 " Darcy Richardson Running Against Obama in NH's Democratic Primary, May Win ALL State Delegates	"
Did you know that Democrats will have a progressive alternative to President Barack Obama on the ballot in New Hampshire tomorrow? We're guessing you didn't. Moreover, how ironic is it that Darcy G. Richardson, the only progressive Democrat with the courage to challenge the incumbent Democratic President in tomorrow's "First-in-the-Nation" primary, at one time managed the 1988 Presidential campaign of the late Sen. Eugene J. McCarthy? It was McCarthy's receipt of 42% of the vote in the 1968 NH Democratic primary which led to the announcement by President Lyndon B. Johnson that he would neither seek nor accept the nomination of the Democratic Party for President. How predictable is it, given the utter failure of the corporate owned media to fulfill its constitutionally envisioned function of insuring an informed electorate, that so few Americans are so much as aware of the fact that President Obama is not running "unopposed" in tomorrow's 2012 NH Democratic Primary? I had originally hoped that somebody like Robert Reich, the former Secretary of Labor, Senator Bernie Sanders of Vermont, Columbia University economist Jeffrey Sachs, U.S. Rep. Dennis Kucinich of Ohio or Florida firebrand Alan Grayson would carry the progressive banner against the Obama Administration. I have personally encouraged several of them to run, without success. I simply didn’t anticipate the kind of paralysis that seems to have immobilized the party’s progressives when it comes to challenging a sitting President of their own party. Sadly, there’s no Gene McCarthy on the horizon. "The Obama administration," Richardson contends, "is a case study in the corrupting influence of Wall Street money in American politics." He excoriates the President for failing to resurrect Glass-Steagall and for saddling us with three new NAFTA-like "free trade" agreements which, in a previous article, we suggested would likely produce the next "giant sucking sound" of rapidly outsourced U.S. jobs. Richardson blasted the President for his escalation of the war in Afghanistan, his failure to close Guantanamo, the extension of the Bush tax cuts and his failure to stand up to the relentless GOP assault on the working class. In a televised appearance (see video below), Richardson explained that he did not enter the race with the expectation of prevailing but because "somebody has to address these issues and no one is addressing them." Under "issues" at his website, Richardson links to the New Progressive Alliance (NPA), whose endorsement reflects his acceptance of the United Progressive Platform --- a platform that, according to NPA, "combines the ideals of four present-day and two foundational organizations." Those organizations include the Green Party, United Progressives, Socialist Party USA, and the 1892 & 1912 Progressive Parties. The United Progressive Platform contains many points that have been raised by the spontaneous democratic uprising, "Occupy Wall Street." It includes opposition to "war as an instrument of foreign policy." This entails not only an end to all combat in places like Iraq, Afghanistan and elsewhere and an end to the funding of private security forces for those conflicts, but the gradual elimination of our global military presence accompanied by significant reductions in military spending. A sustainable society needs clean, green jobs based on renewable energy, energy conservation, organic agriculture, local food production/distribution, mass transit, waste management/recycling, and similar practices that sustain the environment. NPA calls for a "real social safety net" that would be sustained by raising taxes on corporations and the wealthy while "targeting public and private investment in education, research and development, and infrastructure." NPA calls for a single-payer, Medicare for All health care system and the replacement of so-called "free trade" with "fair trade" that protects "labor, human rights, economy, environment and domestic industry of this nation, and those of partner or recipient nations." NPA takes a progressive stance on human rights, equal protection and civil liberties including a demand for the immediate repeal of the USA PATRIOT Act, and a restoration of the right of habeas corpus. Of particular note to readers of The BRAD BLOG, amongst the NPA election reform proposals is a call for "the use of auditable, hand-counted paper ballots in all local, state, and federal elections," equal access to TV and radio by all candidates, and their inclusion in "all public debate forums" --- a need we recently addressed in relation to the corporate media's exclusion of former LA Governor Buddy Roemer from all GOP presidential debates. Unfortunately, NPA also supports the ill-advised idea of Instant Runoff Voting (IRV) or Ranked Choice Voting (RCV), something that this site has long decried, along with Vote-by-Mail and Internet Voting, as an "Election Virus" that, while often raised by otherwise well-meaning election reformers, remains a terrible idea in a country where we have enough trouble simply adding one plus one in a transparent, verifiable fashion. But, hey, you can't win 'em all. Beyond that, NPA's platform is covers many of the key issues this site has long supported. That so few may be aware of the Richardson candidacy is deeply troubling. Representative democracy entails the informed consent of the governed. How can "informed" consent ever be given by a people who are unaware of the identity of the candidates for public office, let alone their positions on policies that can potentially effect not only our economy and our freedom but planetary survival? Did President violate of NH Elections Code? But while the electorate has been uninformed about who is running on the Democratic side of the aisle in New Hampshire tomorrow, it seems President Obama hasn't even bothered to worry about it himself, as apparently his campaign didn't even bother to follow the law for ensuring his own delegates would be properly registered in the Granite State. Sections 655:50 & 655.51 of the New Hampshire Elections code [PDF] provide that presidential candidates "shall file with the secretary of state no later than the third Friday of the last day of the filing period for the presidential primary the names and addresses...of the delegates and their alternates...who shall represent the candidate as his or her delegation to the national convention." The selected delegates and alternates must then file a certification. Legally, the word "shall" as used in a statute is ordinarily considered mandatory. According to an exclusive report by Frank London at Richardson's "Battleground Blog" only two Democratic candidates --- Richardson and Aldous C. Tyler --- timely submitted their lists of delegates. Tyler subsequently dropped out of the race and endorsed Richardson in his stead. While it appears that President Obama, by failing to timely submit a list of delegates, has violated a mandatory provision of NH elections law, it raises the amusing question as to whether Richardson is the only candidate who is qualified to send NH delegates to the Democratic National Convention --- amusing but highly unlikely since Section 655.50 does not spell out what occurs when its mandatory provisions are violated. « PREVIOUS STORY "The GOP's 2012 Iowa Caucuses: A National Model for Transparent Democracy"
"Darcy Richardson Running Against Obama in NH's Democratic Primary, May Win ALL State Delegates"
Someone needs to call the Prez to the carpet for abandoning "hope' and continuing the worst of the Bush era 'changes', for his lackluster push for national healthcare and actual caving to the insurance companies, for not holding Wall St. accountable for destroying the economy, for not fighting for basic human rights in the continuing the eternal 'war' on terror. Sigh, the list goes on and on. The corporate media knows who supports their personhood. Obama embedded and has to sleep in it. It remains to be seen how many people who voted for him fell asleep with him after he won the election in 2008. As it stands now, our choice will probably end up being Sleepy, Dopey, or Grumpy. Either way, it is a nightmare scenario ahead. Thanks for the heads up Ernie, at least we can reminisce about coulda, woulda, and shoulda. Does anyone know how the vote went? According to Firedoglake, Obama got 36,000 votes or 82% of the Democratic vote based on 78% of the vote in at 11 pm. The balance was divided between thirteen candidates. It appears that Richardson and Aldous were the only candidates who timely filed their slate of delegates, and, as indicated above, Aldous dropped out and endorsed Richardson. Now, the interesting event will occur if Richardson goes onto the South Carolina ballot where Alvin Greene demonstrated that anyone can win on an ES&S iVotronic.